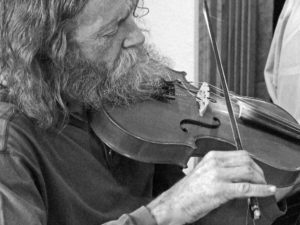 Randy Crouch is known as an abnormally talented fiddler with an unorthodox style. He is also the master of several other instruments, most prominently guitar. Crouch is one of the true pioneers of early Red Dirt music; Cody Canada and Jason Boland are two of the stars in the genre and have both cut versions of Crouch’s songs. They’re not the only ones who often cite him as their inspiration. “Randy is a wizard, a virtuoso, an explorer, a tall tree. His sonic beliefs fully intact, he plays like a beacon of joy, empowerment, and integrity for all to hear. A national treasure,” says Reed Mathis, noted for his innovative and inspired playing with nationally touring jambands like Tea Leaf Green, Jacob Fred Jazz Odyssey and Billy and The Kids. Reed knows Randy well from growing up in Tulsa and beginning his own musical career here in Oklahoma. Though Crouch, our hillbilly Hendrix, once packed large venues and dance halls with his own bands, many music fans these days recognize Randy as a member of the Red Dirt Rangers. Whether as bandleader or sideman, most members of the public seem to define Crouch by his instrumental prowess and ingenuity. First and foremost, though, Crouch considers himself a lyricist. This is the reason why so many Red Dirt bands choose to play his songs on their records and in their live sets. Crouch has a deep and varied song catalog that includes tunes from any of a number of genres. When I first met Randy Crouch in 1996, he only had two albums available – It’s Too Bad and The Flying Horse Opera. Certainly this wasn’t because that was all he had recorded to date; in fact, Crouch has been recording since the 1970s, and since I met him he has had a few new albums come out and had a few older things compiled or reissued. He’s just had trouble keeping old recordings available. For an artist of his import and influence, he has truly been under-recorded. That is to say that he has simply not been recording releases as often as he would, could or should have. As he’s grown older, though, Crouch has significantly upped his album release pace. In 2009, Randy Crouch released Just a Few More Things with The Stragglers rhythm aces Grant Tracy and Brad Rice. Assisting with production and serving as sound engineer was the beloved Robert Smith; an aspiring writer with a tremendous song catalog, Smith’s band Juniper Point had great potential. Regrettably he has since passed away. Just A Few More Things has Crouch as the vocalist, primary electric and acoustic guitarist, fiddler (of both violin and viola), and manning both the pedal steel guitar and keyboards. If you have seen Randy’s live show, you know that he’s apt to attempt to recreate this by playing all those instruments simultaneously. That is only a slight exaggeration – Randy really does pull off some crazy stuff in concert! Despite Crouch’s one-man-band abilities (or maybe because of it), two other very high level players were called in to contribute to the album: Thomas Trapp, who is a master acoustic guitarist, and Texas fiddler of great repute,Doug Moreland. In 2012, Crouch reemerged with Me and You, an album recorded using his primary backing duo, Dan Hoffstatter on bass and David Teegarden, Jr. on drums. Hoffstatter has been accompanying Randy for nearly 20 years, while David Teegarden is the younger model of a famous Tulsa Sound drum machine of the same name. Both Junior and Senior Teegardens lend a hand in this record, which was cut at the Teegardens’ Natura Studio near Tulsa. In some ways, Me and You is like the “Greatest Misses” album that Crouch has always threatened to make. There are both old and new songs on this disc. The tracks here are re-recordings of Crouch’s best songcraft, and are now the definitive versions of these songs. In some cases, prior recordings of these tunes sounded dated, or they just didn’t have the technical precision they needed. Such previously released, but never before so powerfully preserved songs include “Monster”, “Time Bomb”, “Mexican Holiday” and “The Epic”. Then there’s “Price of Gas”, which has been fairly well preserved on record a la The Boys from Oklahoma band. Then there is “Hope You Make It”. This song is such a standard among generations of Red Dirt bands that even some cover versions are excellent. I’ll steer the middle course on this one and say that the version on the recent Crouch disc is indeed excellent, though my fondest memories dictate that my favorite version of this song is the one preserved on Boland’s Somewhere in the Middle album. That version was led by Randy himself, though recorded under the Stragglers’ moniker. Now in 2015, Randy’s still riding high on No Good Reason. The album’s title track is another long pre-existing Crouch song, but again, one without any significant prior release. “Something’s Wrong” is another older song but this version delivers the tune’s full promise. The same can be said of “Big Shot Rich Man”, “Got Time to Party” and “Peace on Earth”. Another old favorite, “On the Illinois”, now has a companion piece, “Under the Illinois”, which serves as an extended ‘outro’. Talking with Randy, he makes it clear that he has many new songs now, too. Ones he’s readying for recording sessions as soon as possible. Though he’s probably still got some time to make up, it seems that Randy is rapidly remedying his under-recorded artist status. Music lovers will all give thanks for the fruits of his creativity and talent. Randy’s live shows are spectacles to behold, so if you find yourself able, attend a show and secure his CDs there.